First home port, Mobile, Alabama. 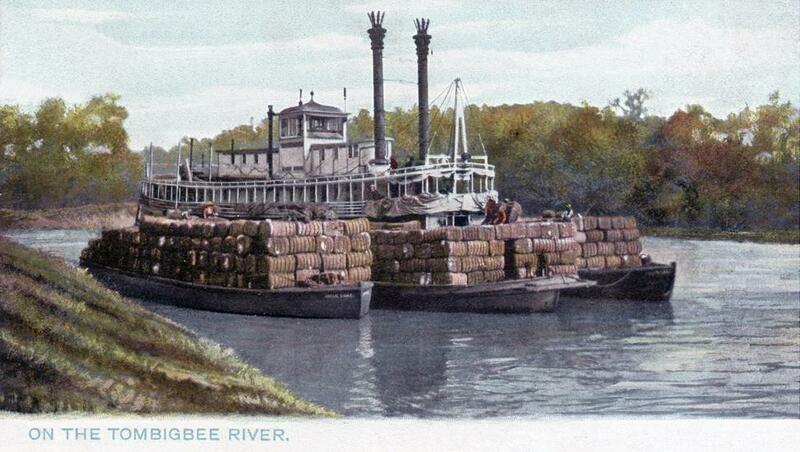 Built for the Mobile-Tombigbee River trade. In the fall of 1914, she ran New Orleans-Baton Rouge. This postcard was dated 25 December 1906 on the front, not post marked so it must've been enclosed in an envelope when it was sent. ART PUBLISHERS TO THEIR MAJESTIES THE KING AND QUEEN. "In the Land of Cotton." THE BOAT IS THE "LITTLE OUACHITA" BUILT AT HOWARD'S IN 1899 TO RUN ON THE UPPER OUACHITA IN LOUISIANA TO BRING COTTON DOWN TO MONROE TOO BE THEN SHIPPED ON THE "AMERICA" TO NEW ORLEANS. 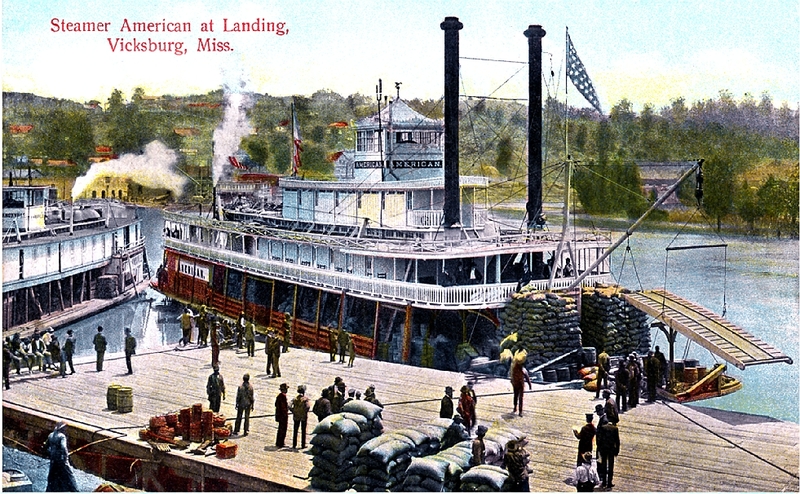 CAPTAIN COOLEY HAD BUILT THE "AMERICA" IN 1898 AND THEN HAD THE "LITTLE OUACHITA" BUILT THE NEXT YEAR. HE SOLD THE "LITTLE OUACHITA" IN 1906 TO THE ALABAMA RIVER PACKET CO. THE PILOT HOUSE WAS RAISED AND THE NARROW TEXAS BUILT IN FRONT OF AND BEHIND IT AFTER IT GOT TO MOBILE. 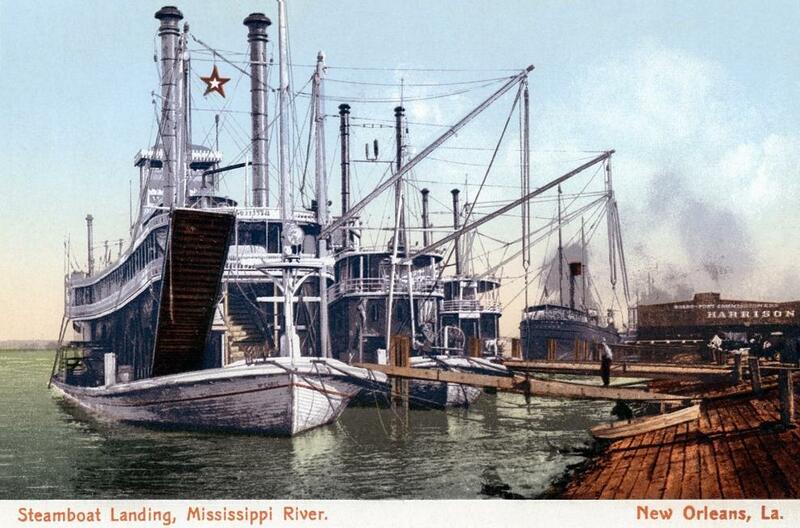 THE "LITTLE OUACHITA" WAS LAID UP IN 1909 OR SO ABOVE MOBILE WHERE A PICTURE FROM THE MURPHY LIBRARY WAS TAKEN. THE BOAT LOOKED A LOT BETTER BEFORE THE TEXAS WAS ADDED. 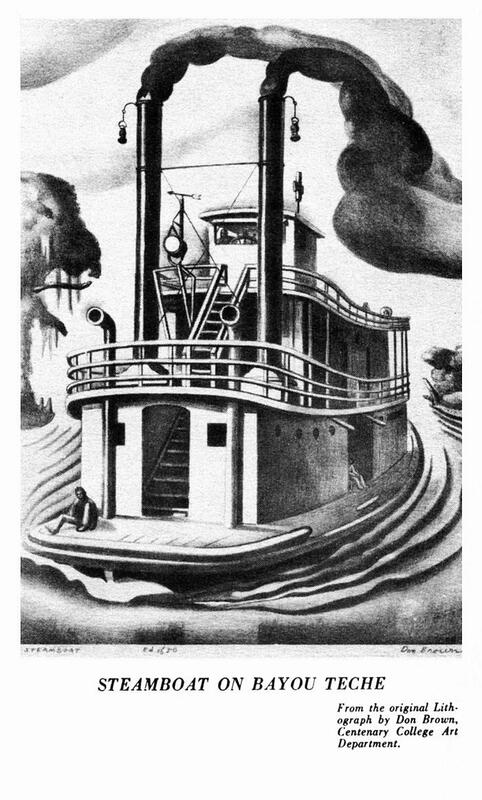 The steamboat LITTLE OUACHITA pushing barges (above) was the same boat that Robert Rucker painted as a "haunted" sternwheeler and we paired his painting up with a photo from the La Crosse collection here: illustrations8. Undated and un post-marked lithographed post card of the W.J. YOUNG JR. at Rock Island, Illinois.Printed in Germany for W.G. MacFarlane, Publisher with offices in Toronto, Buffalo and New York. Enrolled at the Port of Dubuque on May 16, 1882. She was a rafter on the upper Mississippi River until sold to the Carnival City Packet Company in 1895 and remodeled into a packet by extending her cabin, building a half texas behind the pilot house and adding a swinging stage. She ran Davenport-Burlington. In May 1890, as a rafter, she was going downriver with a raft of logs when she encountered the wreck of the NOMINEE. In her nine years as a packet, she never broke down. Sold to the K & I Bridge and Terminal Company in 1903, converted into an excursion boat and renamed HIAWATHA. Built in 1898 at Jeffersonville, Indiana by Howard Ship Yard for the Vicksburg and Greenville Packet Company. 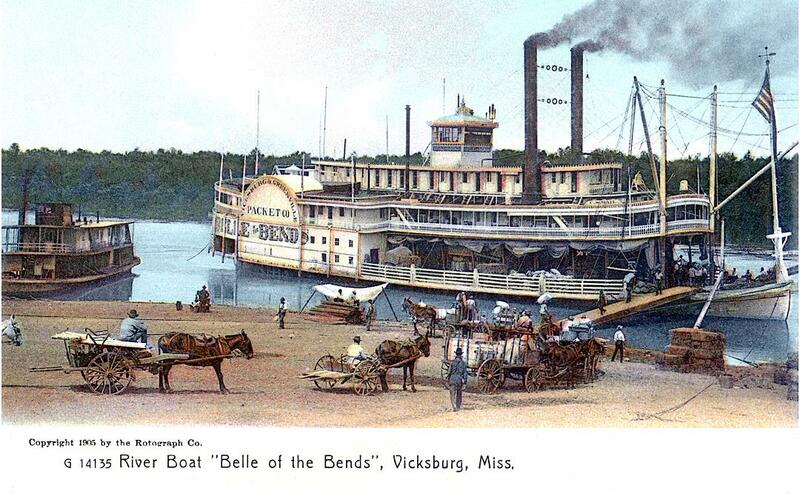 Original price $33,500; home port or owner's residence circa 1898 was Vicksburg. One of the more handsome of medium-sized sidewheelers; had all the Anchor Line grace, double stages and all. Ran Greenville-Vicksburg for many years—from 1899-1904 or later made twice weekly mail runs between those two cities for the packet company of that name. Was flagship of the parade celebrating the opening of the canal at Vicksburg when the Yazoo River mouth was diverted on January 17, 1903—quite an occasion inasmuch as Vicksburg had virtually been cut off the river since Centennial Cut Off which happened April 26, 1876. 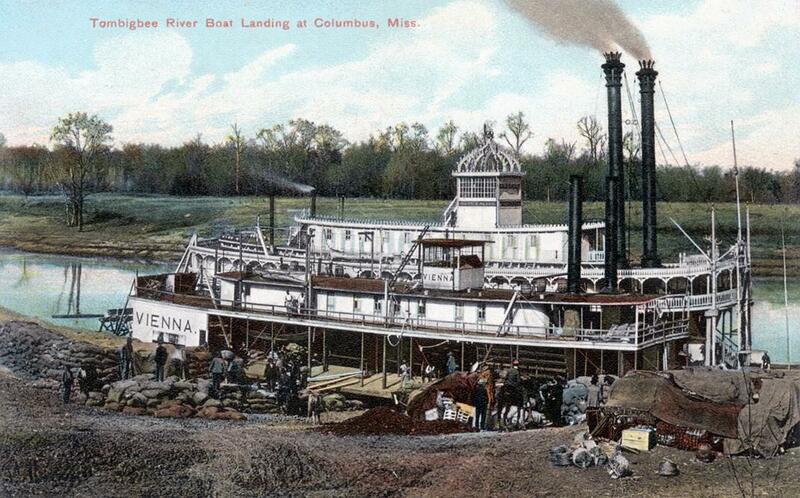 Sank at Peeler's Landing, 40 miles above Vicksburg, September 1909, and was raised. Sank at Fitler's Landing, 20 miles below Lake Providence during a snowstorm in February 1910 and was raised. Another version states that she was caught in a heavy snowstorm while proceeding up the Mississippi River shortly after leaving Hayes Landing, Mississippi on February 10, 1910 and ran aground at full speed on a sand bar; estimated damage $10,000. Then operated by Captain Morrissy; ran excursions at New Orleans in the winter 1910-11. Used in the Nashville grain trade after 1904. Was converted into an excursion boat and renamed LIBERTY. In 1940 her roof bell was at the Altheimer Plantation near Pine Bluff, Arkansas. WM. GARIG far left at New Orleans. Nice silk screen effect employed in the color lithography Published by The New Orleans News Company, New Orleans, La., printed in Leipzig, Dresden, Germany. We have another photo of the WM. GARIG in my collection, the 2nd image on Photos 5, a favorite of Jim Hale's. Her machinery and boilers came from the JULIAN POYDRAS. Her last run in the south was New Orleans-Camden on the Ouachita River in 1917. In March, 1918 she was sold to the Eagle Packet Company, rebuilt and renamed GOLDEN EAGLE. 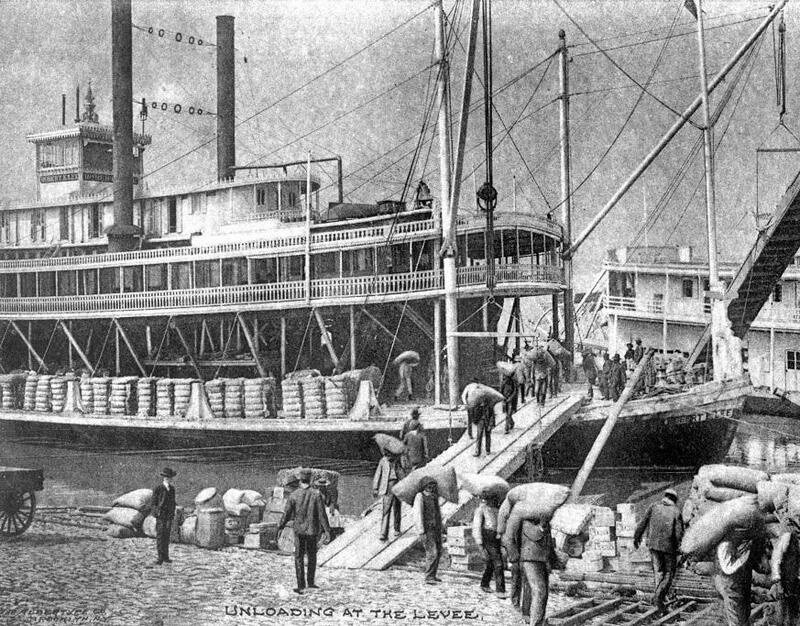 On the left in "UNLOADING AT THE LEVEE" is probably the second boat to be named ROB'T E. LEE 1876-1882 after the first one, the "racer" ROB'T E. LEE had been dismantled. This is a detail of a postcard printed in a printing process produced by The Albertype Co. of Brooklyn, NY (they are credited in the lower left hand corner). Ralph Du Pae copied this from the one in my collection and it was a favorite image of his and it was always in the boxes of 8 x 10's that he took with him to all the steamboat buff gatherings in such places as Marietta, Ohio and Keokuk, Iowa. There is a sign on the starboard side of the hurricane roof, the lettering of which had been "whited out" by the publisher. I believe that it probably said ST. LOUIS AND TENNESSEE RIVER PACKET COMPANY. 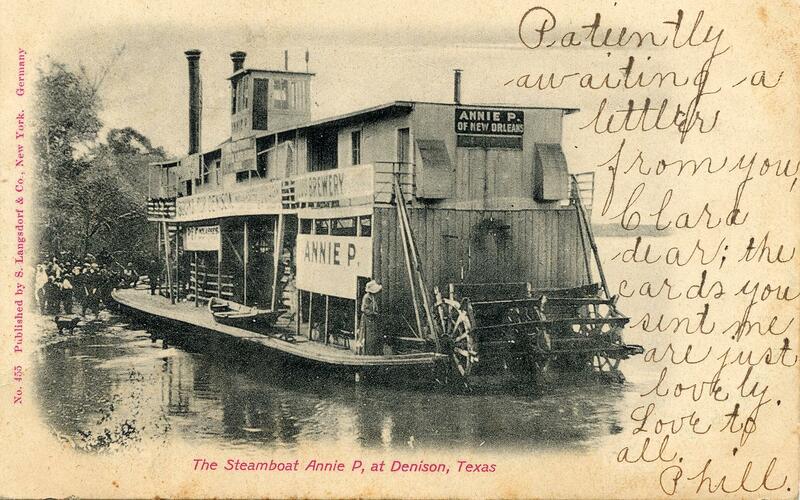 Attached is a postcard of the rough 'n ready Annie P. (1904 - 1909), who according to Fred Way Jr. was the only steamboat in the 20th Century to reach Denison, Texas (which is on the Oklahoma border) via the Red River on April 22, 1905. There's a comical air to the picture with the the dog standing on the shore and the lady with the big bonnet on the fantail looking at the sternwheel. You can read promotional banners for a molasses company and a brewery on the portside. 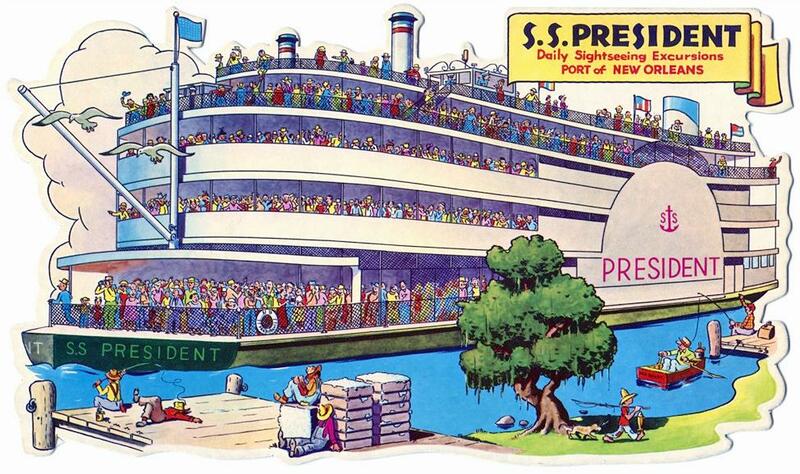 5.20 x 8.75 outsized dye cut postcard with cartoon graphic of the PRESIDENT Published by Grant L. Robertson, Metairie, Louisiana Mirro-Krome card by H.S. Crocker Co. Inc. San Francisco, Calif. Looks like circa 1950's. The characters on the docks, fishing etc. are fun. Also attached a photo of the Streckfus CUB PILOT pin from the PRESIDENT which you might prefer to use with this rather than the color photo composite I sent yesterday with the pin suspended over the PRESIDENT. Streckfus Steamers issued this pin 1.20 inches in diameter that was probably intended to be given to honored guests who visited the pilot house of the PRESIDENT and were privileged to "steer" for a while under close supervision. After being sold to Streckfus Steamers, she received an entire new superstructureand came out on July 4, 1934 as the best excursion boat on the rivers. She could carry 3,100 passengers. In 1944, after she became the full-time excursion boat in New Orleans, her guards were glass-enclosed. In 1978 she was converted to diesel. Don Brown is a nationally known Southern artist who is head of the art department at Centenary College, Shreveport, Louisiana. His works have been exhibited in New York, Paris and other centers and he is represented in many of the leading museums of the United States. Louisiana scenes and people are his favorite subject matter. 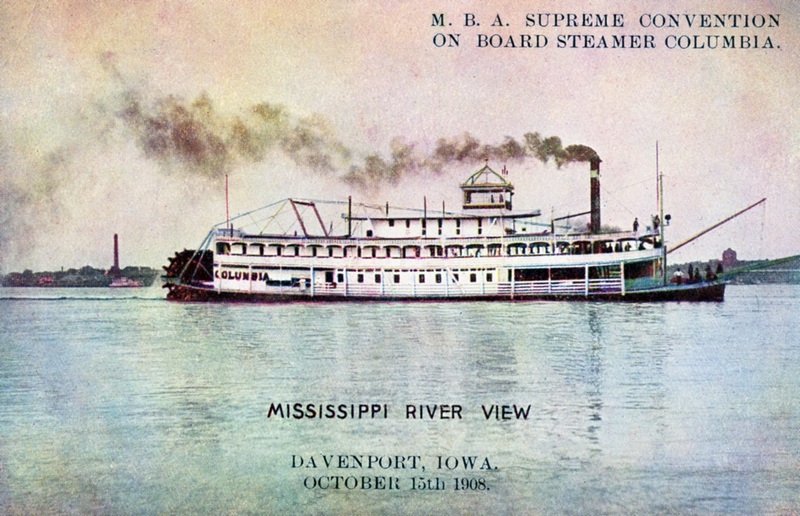 Postcard of the COLUMBIA with text on the front of the card in recognition of the M.B.A. Supreme Convention at Davenport, Iowa 15th October, 1908 which coincides with the establishment at the Harvard Graduate School of Business Administration of the first Master of Business Administration program in 1908 with 15 faculty members, 33 regular students and 47 students. If the M.B.A. on this postcard refers to another organization it would be a strange coincidence when the M.B.A. as we know it today was originated in 1908. A Master of Business Administration (MBA or M.B.A.) holds a master's degree in business administration (management). The MBA degree originated in the United States in the early 20th century when the country industrialized and companies sought scientific approaches to management. The core courses in an MBA program cover various areas of business such as accounting, finance, marketing, human resources, and operations in a manner most relevant to management analysis and strategy. The Harvard Graduate School of Business Administration established the first MBA program in 1908, with 15 faculty members, 33 regular students, and 47 special students. Its first-year curriculum was based on Frederick Winslow Taylor's scientific management. The number of MBA students at Harvard increased quickly, from 80 in 1908, over 300 in 1920, and 1070 in 1930. At this time, only American universities offered MBAs. Other countries preferred that people learn business on the job. 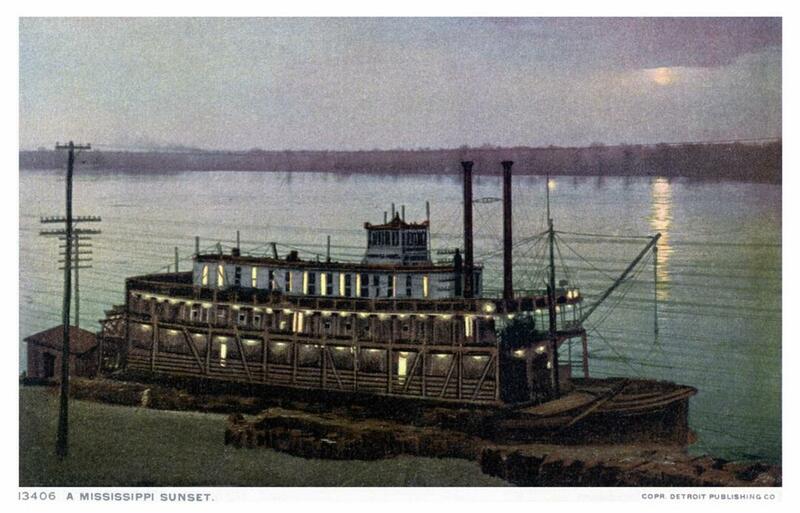 Number 13406 "MISSISSIPPI SUNSET" "PHOSTINT"postcard "made only by Detroit Publishing Co." Trade Mark - Reg. U.S. Pat. Off. One of the publisher's artists turned a photo taken in the daytime into a sunset/dusk scene with some lights on deck and from inside open doors on the texas, the cabin on the boiler deck and the main deck. Boat looks familiar and if the daytime photo turns up the name of the boat will probably be readable at the stern and on the pilot house name board. I have it on good authority from Jim Hale that this scene shows Yazoo City, Mississippi not Vicksburg. La'rn somethin' new ever' day. 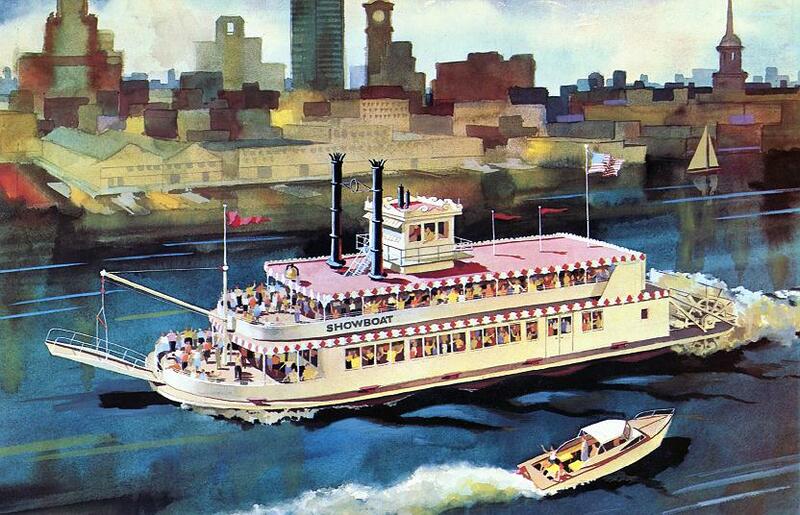 Nicely painted commercial artist's watercolor promotion art reproduced on a 5 1/2 X 8 1/2 postcard for an excursion boat operating on the Delaware River at Philadelphia around 1970. 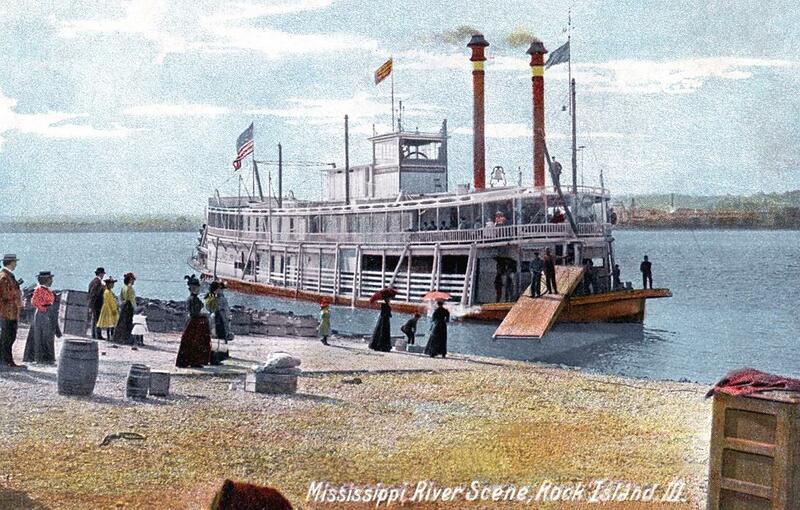 Source: Steamboats.org article on Dubuque-Built Diesel Excursion boats, by Travis Vasconcelos.